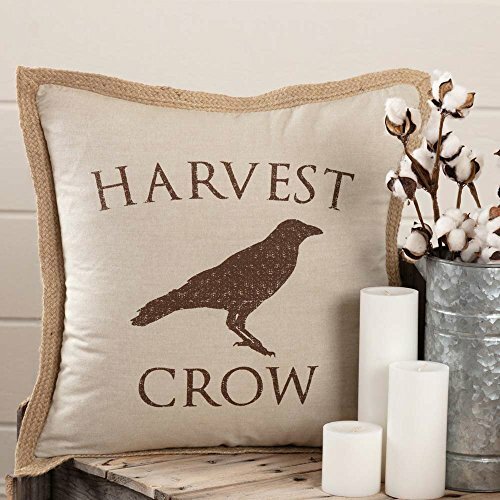 If you want an easy update for your country farmhouse or vintage cottage this fall, you can easily change your current look with our Harvest Crow Pillow Cover! There's no easier way to change the mood of a room than by switching your throw pillows! Create an instant upgrade to your family room, kitchen bench, front porch or bedroom without any hassle. The cover features a warm taupe chambray background with aged chocolate brown lettering and crow detail. The pillow reverses to the Farmhouse Taupe Ticking with a braided rope trim edging the entire pillow cover. The trim brings interest and texture to the look, as do the 2 handsome wooden button closures featured on the back. Designed to coordinate with other pillow covers and linens in our collections. You can mix and match to your heart's content for a charming, cohesive designer look. Fabrics in matching or complementary colors include the Pumpkin Farm Pillow Cover and the Farmhouse Ticking Taupe Collections. Warm beige chambray fabric printed with chocolate brown crow and lettering with an "aged" appearance. Reverses to a taupe and off-white simple ticking fabric with 2 wooden button closures. Trimmed with 1" braided rope flange. If you have any questions about this product by Piper Classics, contact us by completing and submitting the form below. If you are looking for a specif part number, please include it with your message.